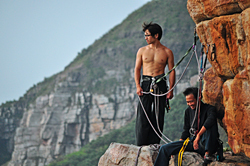 The climbing area is comprised of several dozen cliffs along 2 km of coastline, rising from the ocean or fronted by terraced ledges above the sea. The cliffs are generally east-facing and hidden from nearby towns and from the coastal highway, which passes through a tunnel above the cliffs. The stone is compact Silin sandstone, with excellent cracks forming well-protected trad routes, as well as clean faces featuring thought-provoking sport climbs. 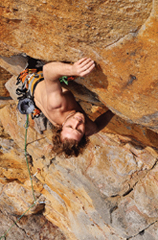 Most routes are between 15 and 30 meters in length, with good anchors and well-maintained bolts on all the better sport climbs. The presence of high-quality routes across all grades is a trademark of Long Dong – there are outstanding 5.6’s, ultraclassic 5.13’s, and everything in between. There remains much potential for new routes: several unfinished projects of good quality in the 5.13+/.14- range, undeveloped faces, and awe-inspiring trad routes yet to be freed. Bouldering potential exists as well, though probably not enough to qualify as a bouldering destination. There is some deep-water soloing (DWS), with a couple decent DWS routes around 5.8. Cliff-diving opportunities are everywhere.<br />There are two main entrances to the climbing area and the climbs are described in eight sectors: the south parking area (near Silingyan Temple) is used to access Back Door, Golden Valley, and First and Second Caves; while the north parking area (near Ho-Mei Elementary School) is used to access Grand Auditorium, Music Hall, Long Lane, Clocktower, and School Gate. There are public bathrooms at both north and south parking areas, and limited services (showers, food) are available in summer at the north parking area, as well as at Longdong South Ocean Park (the large white building near the south parking area). Approach times from parking areas to crags range from three to thirty minutes. A single 60-meter rope is ideal. A dozen quickdraws will suffice for most sport climbs. Trad climbers need nuts and a single rack of cams up to a #3 Camalot; offwidth fans could add a larger piece or two. 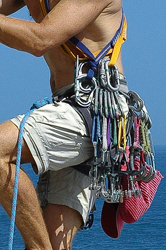 Popular routes are equipped with solid, well-maintained top anchors; however, if you climb obscure or adventure routes, bring webbing and trad gear to reinforce old anchors. Helmets, while not mandatory, are always a good idea. Bring food and water as there is none available at the crag. Swimming clothes and goggles can be useful in summer. Metal hardware should be washed after a few days of climbing in the marine air. A simple rinse in hot water, along with occasional application of a good lubricant (WD-40 works well but more ecological alternatives can be found at bike shops), should keep gear working smoothly. Do not let nylon (rope, sling, draws, harness) contact petroleum-based lubricant. Northern Taiwan is hot and humid in summer, with highs from 33 to 37 degrees C (90 to 100 degrees F). Winter is climbable if dry, though the period from January to March sees a lot of rain; lows can be 5 to 10 degrees C (40 to 50 degrees F) but it’s frequently warmer when sunny. Spring and fall can be wonderful. Nice days occur in any season. Basic drinks and snacks (including local seaweed jelly) and cold showers are sometimes available in summer at a small shop in the north parking area. For food supplies, real coffee, and clean bathrooms, there are convenience shops in Aodi, on the coastal highway 6 kilometers south of the south parking area. The Northeast Coast is well-known throughout Taiwan as a destination for seafood connoisseurs. A wide selection of restaurants can be found nearby in Jiufen to the north and Aodi to the south. A personal recommendation is "Legend of the Bay," near the temple in Aodi, with pleasant atmosphere and very good service as well as excellent food, including tasty vegetarian fare. Night markets in Keelung and Reuifang offer a broad array of Taiwanese food from street vendors. The "FuBar" near the large temple at the south end of Fulong beach, 12 km south of Long Dong, features excellent South African barbeque and is probably the best place on the island to sit outside and enjoy a cold drink. In 2011 a new guesthouse opened in Ho-Mei village at #3 Lung Tung St., about 100 meters from the trailhead. Rates start at about 250NT per person for a 4-person room with A/C. For reservations, contact Mr. Chen at 02-2490- 9546. There is a gas station in Aodi that closes at 10:00 p.m.; a 24-hour gas station is near the intersection of Highway 62 and the coastal highway (12 km north of Long Dong). ATMs can be found in convenience stores in Aodi, 7 km south of Long Dong. There are no climbing-gear suppliers near Long Dong; the nearest shops are in Taipei, near Taipei Main Station. Excellent wild camping is possible throughout the climbing area; carry in all food and water and please take out all trash. There is also a small, secluded car park (with no services) accessed from the coastal highway near the tunnel above the cliffs where one may pitch a tent overnight. A commercial campground called Longmen is on the coastal highway near Fulong, about 15km south of Long Dong. The attractive tourist town of Jiufen (Chiufen), about 20km north of Long Dong, is loaded with guesthouses and hostels at a variety of price levels. See a travel guidebook for information. The nearest full-service hotel is Jo-An Hotel (www.joan.com.tw) in Aodi, 7 km south of Long Dong. From Taipei or anywhere on the west coast of Taiwan, drive north on either National Freeway 1 or National Freeway 3. If using Freeway 3, transfer to Freeway 1 (northbound) at the freeway intersection near Sijhih. On Freeway 1, pass the Sijhih toll station and take the exit for Highway 62. Follow Highway 62 for 15 km to its end, where it intersects with Highway 2 (the Coastal Highway) at Rueibin. Turn right on Highway 2 and drive southeast for 12 winding, scenic kilometers to Long Dong. head east on 62, toward Rueifang. Drive 16 km on Highway 62 to its end where it meets the ocean at Rueibin. Turn right onto Highway 2 (the Coastal Highway) and drive southeast for 12 winding, scenic kilometers to Lung Tung St. (a small street on the left at a traffic light). Turn left onto Lung Tung St. and follow this lane around the bay to arrive at Ho Mei Elementary School (the ?orth parking area??. Park near the school and walk from the end of the parking area on a vague trail through boulders toward the climbing area. Alternatively, continue on the Coastal Highway for 2 km past Lung Tung St.; as you exit a tunnel make an immediate left turn into a driveway entrance to the Silingyan Temple. Drive past the temple for 100 meters to reach the South Parking Area. Walk down steps to reach Back Door or walk uphill on a paved trail toward Golden Valley. From Yilan or elsewhere on the east coast of Taiwan, drive north on the coastal highway (Highway 2). Six km north of Aodi and just after the Longdong South Ocean Park, turn right into the Silingyan Temple and park as noted above for Back Door or Golden Valley; or continue 2 km north on the Coastal Highway and turn right at Lung Tung St. as noted above and park at Ho Mei Elementary School. Take a train or bus from anywhere in Taiwan to Taipei. At Taipei Main Railway Station, follow signs to the Taipei West Bus Station Terminal A (200 meters west of the west exit of Taipei Station). Locate the ticket window and buy a ticket for a bus to Yilan and Luodong, via the coastal highway. Specify that you want to get off at Long Dong Harbor or Ho-Mei (the latter is the village near the north entrance; there is a bus stop on the highway, above the village and Ho-Mei Elementary School); as of 2011, the one-way fare is NT$120, and buses depart at 8:20, 9:20, and 10:20 a.m. daily. Board the bus, take a seat on the left side for ocean views, and expect a 60 to 90 minute ride to Long Dong. Be sure the driver knows your destination. Disembark and walk 10 minutes to the School Gate entrance or 20 minutes to Golden Valley or Back Door. Finding a return bus from Long Dong directly to Taipei can be challenging. Instead, on the coastal highway you can hail a bus heading north to Keelung or Rueifang; in either location you can find another bus or train back to Taipei. If you want to maximize your climbing time, and speed is more important than cost, taking a taxi directly from Taipei all the way to the crag would save a lot of time and hassle. Fares will vary (a rough guess would be NT$1,500 to 2,000) but a metered taxi could be a viable option to consider for someone with limited time who doesn? want to waste valuable daylight on slow public transport. There is a special English line for Taxi service in Taipei; dial 0800-055850 (toll-free) from land line, or 55850 (charge for call) from cell phone. Contact Matt at climbstone@yahoo.com for more information on locating a guide service.